🕦 Online now, ready to trade. 🇳🇬 Nigerian traders are welcome. ✅ e-code always 100% accepted. ✅ Physical card always accepted. ⏱ Get your bitcoins in less than 1⃣minute after sending your gift card. 💨 We redeem your card instantly. We are the quickest Walmart Vendor. 🤠 You don't need to upload a receipt. 😎 Card can be in any condition. Used with previous transactions or brand new. 😎 Card can be any size. 4 cards max per trade. 📽 All trades are screen record and can be uploaded to Youtube if dispute occurs. 💰 We have a .10 btc bond deposited with Paxful. 💯 Perfect rating on Paxful. 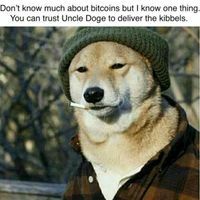 Every successful trade will net you free Dogecoins as our way of saying thank you. Just paste your Dogecoin address after the trade, even days after, and we will send a random amount to your wallet in 1 to 2 days. Note: this is just a bonus offer. 100% of your payment for your card will be paid in Bitcoins through Paxful.